Uh oh. In Wednesday night's first presidential debate,Republican candidate Mitt Romney upset an unlikely...person? WASHINGTON – Uh-oh. In Wednesday night’s first presidential debate, Republican candidate Mitt Romney upset an unlikely…person? “I’m sorry, Jim. I’m going to the stop the subsidy to PBS. I like Big Bird. I like you,” Romney said. Debate moderator Jim Lehrer works for PBS. 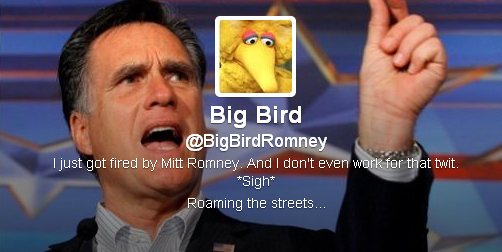 But, while Mitt may like Big Bird, the Bird doesn’t like him – and he quickly expressed his feelings via Twitter. Within an hour of setting up the Twitter handle @BigBirdRomney, the Sesame Street icon had nearly 6,000 followers. Just before midnight he had more than 7,300. Through the debate Big Bird expressed anger, concern and even saddness that the Republican presidential candidate wanted to put him, and his friends from the Street, out of work. And he wasn’t shy about sharing his endorsement for president. However, in a cryptic Twitpic, the Bird seemed to suggest he and Ann Romney had a “thing” at one point – but he didn’t elaborate. The Romney campaign has yet to respond to Big Bird’s requests for comment or clarification. @BigBirdRomney can also be contacted through bigbirdromney@gmail.com, and he’s already making headway on his potential 2016 presidential bid. WTOP’s Lacey Mason contributed to this report. Follow Lacey and WTOP on Twitter.